I feel like as I'm getting older, I see myself doing things like my mom and grandma both did. This has been happening often lately and I actually like it. I smile every time I say or do something that reminds me of them. One of the things I've noticed is that I tend to keep candy in my purse and on my desk because throughout the day, I tend to get a sweet tooth. So I was really excited when I was sent some of Hershey's Lancaster Soft Caramels in both original soft caramel and soft caramel with vanilla swirl. These soft and chewy delights are new to Canada and let me tell you, they are simply delicious. 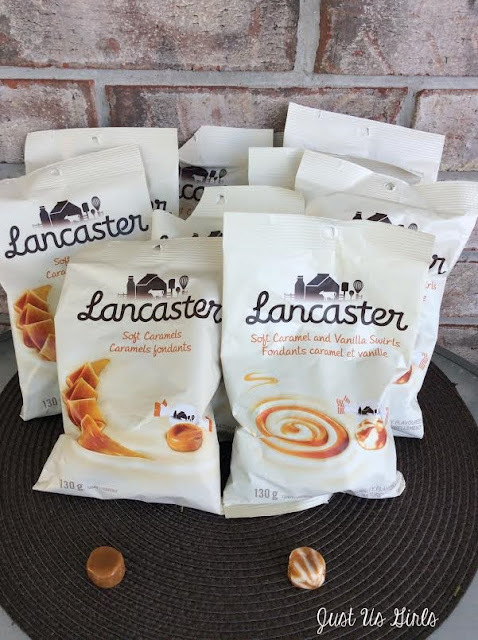 Lancaster Soft Caramels were inspired by similar caramels that company founder, Milton Hershey, made more than 120 years ago in his original candy company located in Lancaster, Pennsylvania. Soft Caramel and Soft Caramel and Vanilla Swirls have a long-lasting and unique caramel sweet taste, with a rich and creamy texture that will melt in your mouth. You won't be able to eat just one. I'm a huge fan of soft caramels and these are definitely high on my list of favorites. I loved that they were sweet, but not too sweet. Perfect for those days where you need something to satisfy your sweet tooth, but they are highly addictive. I opened up the bag and had one and couldn't resist the urge to grab another. I also was a huge fan of the package. It looks like you've paid way more for these delights than you actually did and the taste of these caramels will have you thinking that too. You can take these with you on the go and leave them in your purse or pocket so that you can satisfy your sweet tooth wherever you are. Disclosure: All opinions are my own. I received Lancaster Soft Caramel & Soft Caramel and Vanilla Swirls at no cost for the purpose of this review. No other compensation was received.